Attention Tello owners with iOS. Let’s all request for a Volatello iOS version. The current Tello App is missing the Return to Home feature like the Volatello. It is not a simple transfer since iOS development uses another programming language. It took him hunreds of hours to setup for android and will take that much time again for ios. There is just not enough money in there for him. Good thing he developed on android since bt controller interference seems to be a massive problem on android which his app circumvents by allowing many otg cable controllers. Iphone does just fine with a bt controller at least speaking from the iphone x i use. Not sure about how good rth can be, never once I felt I needed it. During outdoor flights I make sure the wind is good and have a reliable repeater to not drop signal and lose it far away. I am sure that iOS owners want the TelloFPV app, but the simplest alternative to take advantage of this app is to get a good second-hand Android phone so you don't spend too much and enjoy TelloFPV in all its features. 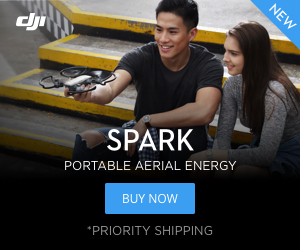 Or get a DJI Spark (or larger) after you learn drone ops on Tello! That’s what I did. I’ll never fly my Tello with my iOS devices again! I love TelloFPV - a big thank you to Volate!lo and all of the testers who help make this the best Android app for flying my Tello. Like someone said before - after buying Tello need to be buy android phone. I got my Old Huawei P8lite and I fly on this phone, having iPhone X in my pocket at this same moment. Flying by iPhone X is not as good as flying on android device in my opinion. This pops up again and again but well... you can unite and request as long as you want. You can stomp your feet, raise your fist and scream until you get read in the face but it does not change anything. You will not get an IOS version anytime soon. I have nothing against apple or apple users, but personally I am not using IOS. I tried it once but made an informed decision to live outside the walled garden of happiness. So what could motivate me to make an IOS version? Money! Now there is no serious money to be earned as TelloFpv is a small niche app and global IOS market share is small. It would take an IOS version several months to generate enough revenue just to pay off the dedicated hardware required for serious IOS development (a few used test devices, and at least a macmini or macbook). The Android version does OK, but even that earns way less money than a normal freelance consulting job. Would I do the same again for maybe 1/4 or 1/3 of the revenue? sorry, certainly not. So whats left? Altruism could be an answer, but ... we are not talking about a favour. We are talking about hundreds of hours of work, that is several months fulltime development! Sorry but I am not altruistic enough for that. So this is just not going to happen - unless I fall in love with IOS which I doubt very much.